Training the next generation of leaders is crucial to spreading the gospel, yet most churches have no formal way of doing this. Why? Tight budgets, small staffs, and a lack of know-how are just a few reasons suggested by church consultants Aubrey Malphurs and William Mancini in this groundbreaking book. "Building Leaders" provides real-life examples of ways churches can unleash their true ministry potential by training staff members and laypeople to lead.With step-by-step instructions that can be applied to any church or parachurch ministry, "Building Leaders" shows readers how to: empower, not just train, leaders; overcome obstacles to developing leaders; identify emerging leaders; use biblical models for training leaders; and, form a leadership training program to fit any size or budget. Packed with surveys, discussion questions, and a leadership development guide, "Building Leaders" will encourage leaders to "duplicate themselves" in order to see their ministry grow. It is a perfect resource for ministry students, church leaders, and pastors. 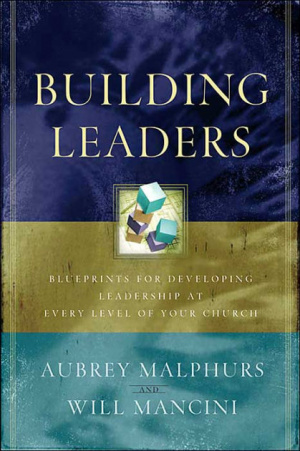 Building Leaders: Blueprints for Developing Leadership at Every Level of Your Church by Aubrey Malphurs;William F Mancini was published by Baker in March 2004 and is our 28257th best seller. The ISBN for Building Leaders: Blueprints for Developing Leadership at Every Level of Your Church is 9780801091711. Be the first to review Building Leaders: Blueprints for Developing Leadership at Every Level of Your Church! Got a question? No problem! Just click here to ask us about Building Leaders: Blueprints for Developing Leadership at Every Level of Your Church.